I grew up on a dairy farm in Stoneyford near Colac, which is about 160kms from Melbourne, with my parents and three younger sisters. I would milk up to 140 cows a day with my dad, Robert. My mother Mona was a secondary school teacher. I completed my secondary school studies obtaining my HSC, in maths and science at Camperdown High. I left home at age 18 to attend Melbourne University, studying architecture. Showing a lack of dedication to my studies, I left Melbourne University and decided to try some other things. My first main job was at the National Australia Bank in customer service. I worked there for about a year, and then worked for about three years in records and property services for the Department of Defence. During this period, I started driving taxis and the extra cash helped fund a tour of England with a group of country cricketers. At the age of 25, I leased some taxi plates and then started to work full time as a driver, working long hours and still finding time to play cricket 3 days a week. At thirty I partnered with a friend to purchase a taxi plate for $120,000. I eventually bought out my friend five years later. I sold the plates in 2002 and purchased another car. I was now running two cabs, ending up with two Ford Fairlanes. A 2002 AU and a 2003 BA model. These both did over 1 million kilometres, the Ford BA is still being driven by my parents after being resprayed back to the original green. In 2005 my wife and I saw Leonardo de Caprio arriving at the Oscars in a Toyota Prius as part of an initiative called ‘Green cars for the red carpet’ and the idea for Ecolimo was born. After struggling to get the Prius licensed as a Hire Car initially, as it fell short of the wheelbase requirement of 2.8m required to be licensed as a hire car in Victoria, we were eventually able to get on the road when Lexus released the GS450h. The 2.85m wheelbase on the Lexus was just enough. With the battery in the boot rather than under the car, there is less room for luggage in the Lexus, but it is a beautiful car to drive and our customers love it. When I look back on the cars that I have owned previously for personal use, they are certainly an eclectic mix. They include my first car, a 1960 FB Holden station wagon. This was a hand me down that was lovingly restored over the Christmas holidays prior to obtaining my licence in 1978. I have always liked English cars, and bought a 1961 Jaguar Mk2 2.4, for $999 in 1979. Luckily I still had the FB. A very reliable and comfortable 1977 Mazda 929 followed before my favourite car, the 1976 Triumph Stag V8. This was also a restoration and I liked it for it’s looks and the sound that came from the small V8, which sounded tougher than it was. Another restoration I did was a 1957 FJ Ute that was a bit of a blast from the past as the handling was not what we are so used to now. Still it was handy for shifting furniture. Having spent so many hours on the roads of Melbourne, it is really amazing how much more traffic there is now. I used to “rat run” my way though the suburbs to save time. Over the years, these short cuts have all been countered by traffic control devices, such as speed humps or road narrowing. There are times of the day where parts of the city are almost at a stand still. Hoddle Street at the end of the Eastern freeway in Abbotsford and Collingwood is always a basket case in peak hours. I guess until there is a continuation of the Eastern Freeway by tunnel, it will remain a problem. After the protests of 30 years ago, there is no way you would try and put a tunnel through North Fitzroy! Springvale Road is another place to avoid. However, that is starting to improve; the new rail interchange has made the area around Nunawading almost passable. It seems as soon as a road is built, cars flock to it. The Ring Road is an example, now almost clogged on a daily basis in both directions. With the ever-increasing number of cars on the road, it is hard to see where traffic flows can be fixed. With the amount of travel we do in business, it would hurt me financially, but I believe the best solution would be a user pays system - either total kms, or by or better tolling through congested areas. With advancements in computing, this should be possible. It just means getting around the public’s perception with the big brother factor! The worst bottlenecks are dependent on times and days of the week. You can find yourself caught in traffic on a quiet weekend, as there are carloads of parents taking children to multiple sporting events, or couples out for a late breakfast, and then the home hunters on a Saturday morning. There are a lot of roads in Melbourne that once accommodated two rows of traffic and are now down to one. This is due to the tarmac being given to bike lanes and also the introduction of curb extensions. The best solution I think would be to ride a bike or to learn some patience. Over the years there have naturally been a few accidents with drivers in the fleet. The red light cameras have stopped a lot of running the lights, and the left hand turn having precedence also makes for less of these accidents. With taxis, they are painted bright yellow for a couple of reasons, one is the safety aspect as this is a highly visible colour. All of our hire cars are painted metallic silver. This is probably at the other end of the spectrum, although I think it may be the most common colour on the road at the moment. With the fixed and mobile speed cameras, the drivers are now sticking to speed limits as compared to previously during my career on the road. When I started driving on Melbourne streets, the speed tolerance was 20km over the set legal limit. It has come down over the years to the standards we now accept. This, and the fact that there are so many more controlled intersections, can lead to trips that were taking 20 minutes, now take 30 minutes at the same time, regardless of traffic congestion. The fact the traffic is travelling slower and cars are designed to be safer, has all lead to the lowering of the road toll, so I guess a little patience is all we need to pay to save the two lives a day compared to thirty years ago. The type of clients that use my service include people travelling for business and leisure. Companies are now increasingly making decisions based on sustainability and like the environmentally friendlier Prius, although some do ask for the Lexus for it’s prestige. We also cater for a lot of ‘green’ weddings where the couple specifically choose a car that has less impact on the environment. Our clients like the fact that our cars are always clean and reliable and the drivers are friendly. We take customers to events which include functions at wineries in the country, photo shoots at the beach, or special occasion dinners in the city. We also transport quite a few celebrities who prefer to be seen getting out of an environmentally friendlier car at events. The Lexus has one of the best cruise controls I have seen so far. It has a radar adaptive cruise control (ACC) device in the grille that enables it to keep a constant distance between you and the car in front. When you are cruising along and another car jumps in the gap it just slows and lets you take it easy. This is the perfect way to avoid getting photographed by a speed camera. As the Lexus is very quiet, especially with the electric motor, you can sneak over the speed limit quite easily without this aid. Sat. nav. is another thing that makes the life of a chauffeur so much easier. There is no substitute for knowledge of the street and traffic flows, but as long as you can get close, it is very handy to have the sat. nav. to guide you into the street that you require. When we were in Sydney, the sat. nav. was very handy. Sometimes not knowing where you were meant that even with navigation you found yourself driving around in circles as the no right turn sign would not agree with what the voice in the car was telling me. I am sure “she” would not pay the fine. We have two Lexus GS 450h (Hybrid). The Melbourne 2006 vehicle has done over 300,000kms in the last three years. The cruise control with radar is one of the best innovations making driving very relaxing. The GS450h is extremely quiet and has excellent performance. The only negative is that it has a small boot due to the batteries being place behind the rear seat. It is great to drive and there have not been any major mechanical problems. 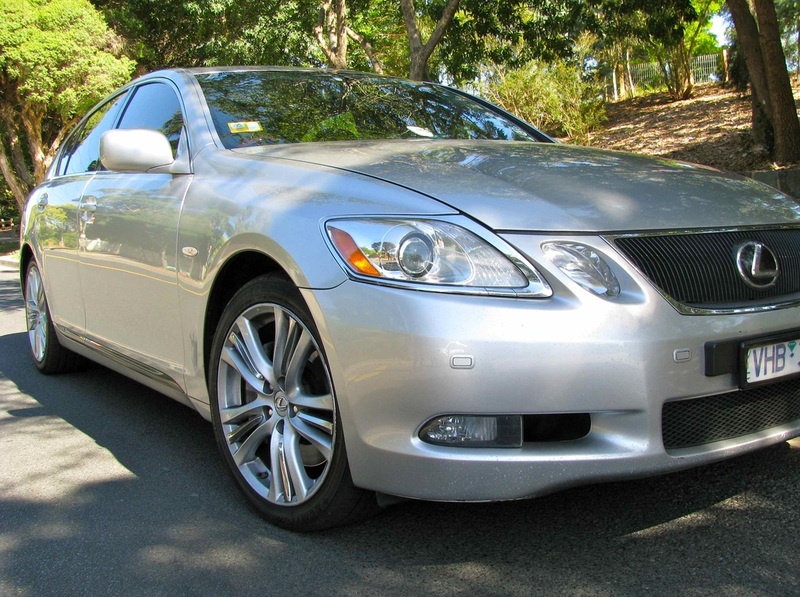 The 2007 GS450h which resides in Sydney has had a replacement motor (after 112,000km). I think this was probably driver stupidity. A failed water pump led to a loss of fluid, and it was driven to death with no coolant until it finally seized up and died. There is supposed to be a fail-safe safety system to protect the motor, but if someone drives the car once the water has gone, it is hard for the system to measure the temperature of air rather than the coolant. I enjoy driving it more than the Toyota Prius. The Prius has a lot more room than it would seem from first looks. There is more leg room as well as good storage in the rear hatch. It is very quiet around town, and clients like it because of the quiet ride it delivers in city traffic. Always check your tyre pressure, we run at 38 PSI. If we have a driver who lets the tyre run low for too long without checking them on a regular basis, you can find the fuel mileage halves and it costs us more to run the fleet of vehicles over a twelve-month period, and therefore affects our bottom line and does not help the environment. Status: Married to Robyne with one daughter Alice. Interests: Architecture, Golf, Cricket, and the AFL and support Geelong. Cars owned: 1976 Triumph Stag, 1961 Jaguar Mk2 2.4, 1977 Mazda 929, 1960 FB Holden Wagon. Education: Studied Architecture at Melbourne University in first year. Profession: Managing Director of Ecolimo Australia. Owner Driver for around thirty years. Dream car: 1960 190 SL Mercedes Benz 2 door. Cars in fleet: We have two Lexus Hybrid GS 450h 2006 and 2007. The Melbourne vehicles has done over 300,000kms over the last 3 years. Servicing Costs average out at $1000 every 15,000kms. I like the cruise control/radar and it is very quiet and has very good performance. The only negative is it has a small boot due to the batteries. It is very nice to drive and there have not been any major mechanical problems other than the vehicle driven by the driver in Sydney. The average fuel usage is around 8-9 litres per 100kms. I enjoy driving it more than the Toyota Prius and it is more fun to drive. Rating: Overall I rate the Lexus Hybrid GS 450h 9 out of 10. We have seven 2006-2008 Toyota Hybrids series 2. Servicing costs average out at around $500 every 10,000kms. It has a lot of room and a good size boot. It is very quiet and clients like it because of the size of the vehicle. The average fuel usage is around 4-5 litres per 100kms. Rating: Overall I rate the Toyota Hybrid 7.5 out of 10 as it is not as fun to drive as the Lexus. New company vehicles: I will consider looking at the New Camry Hybrid made in Australia, and the Lexus RX 450H. The Toyota recalls and issues that is current news, will not affect my decision. The future: We are currently operating in Melbourne and Sydney and may expand to Brisbane in the future. We also plan to license the name in other states. Note: I met Don in 2010 in Hawthorn for this interview. Solving traffic congestion - Traffic Engineer John Cleeland investigates intersection options.